So it’s almost summer, and like many people, I am trying to lose a few more pounds and tighten up some of the giggly spots on my body. Damn you thick thighs!! OK, I digress… Anyway, one of the things I know to be true, whether I actually follow it or not, is that Breakfast (yes, capital B) is important. Regardless of the reasons, weight loss, not snapping at your co-workers because you are starving, or whatever, eating breakfast sets the tone for your day. I am a busy woman. No matter how many times I tell myself that I will be in bed by 10:00 pm, up at 5:00 am so I can workout, get dressed and cook a nutritional breakfast for me and my dear husband…what usually happens is the complete opposite. I am in bed after midnight, bargaining with myself, figuring out what I can do without so that I can get at least another twenty minutes of sleep. I have it bad. I have to do better. I am taking baby steps! So one of the things I have decided to do is make sure I have a good breakfast in the morning, that does not come from the cafeteria or McDonald’s. In order to do this, I have to prep the night before, otherwise it is a wash. I came across the refrigerator porridge recipe a few weeks back and decided to try it, because it looked like one of those weird things I would love. I have been asked what it taste like and if it’s weird eating the oatmeal cold. The answer is no. 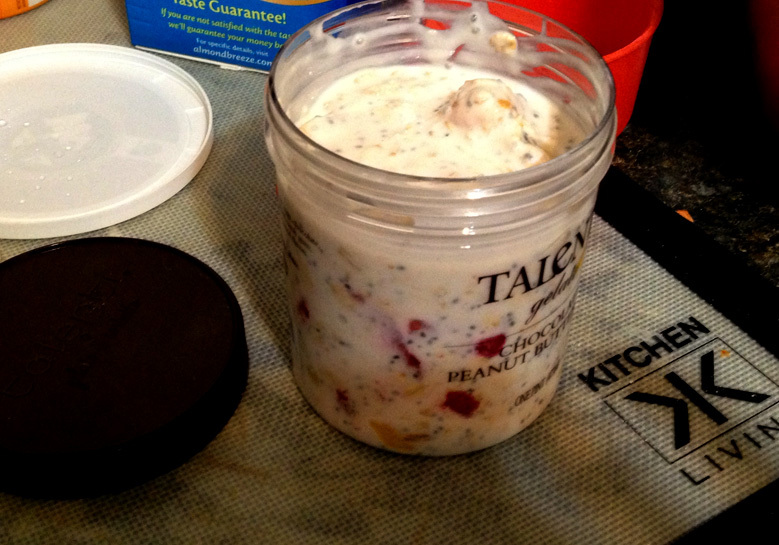 If you like granola and yogurt with fruit, then you will probably like this. It reminds me of a yogurt parfait, where the granola has softened up. I personally prefer that, it is a “mouthfeel” thing for me. The other thing about this is that it is low calorie, low fat, and high in protein. I never, in a million years, would have thought that I would be eating Chia seeds! I have to say, they are freakin delicious! I will probably be experimenting with them a bit more, as the year progresses. In addition to feeding myself in the morning, I also have to feed Mr. B. While he likes to say he isn’t a breakfast person, I know he needs a good meal to start his day. He isn’t really a fan of the porridge, so for him, I have developed the 3 minute breakfast sandwich. With a side of fruit or sometimes potatoes, it is definitely a quick and filling breakfast. 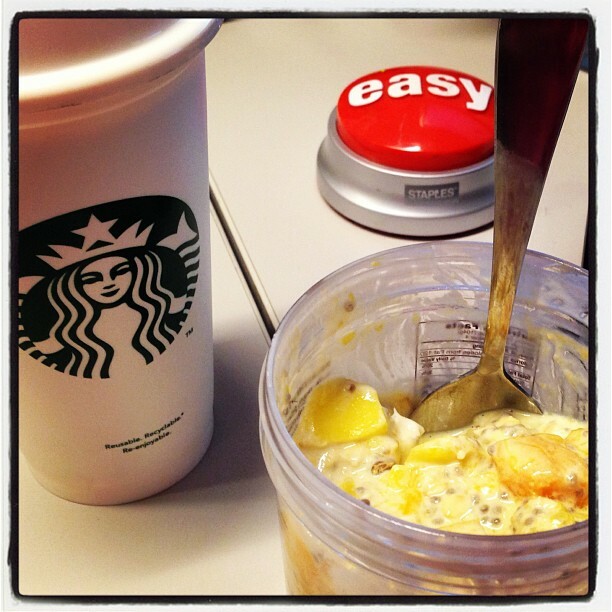 The secret…a plastic 1 cup measure and a microwave! 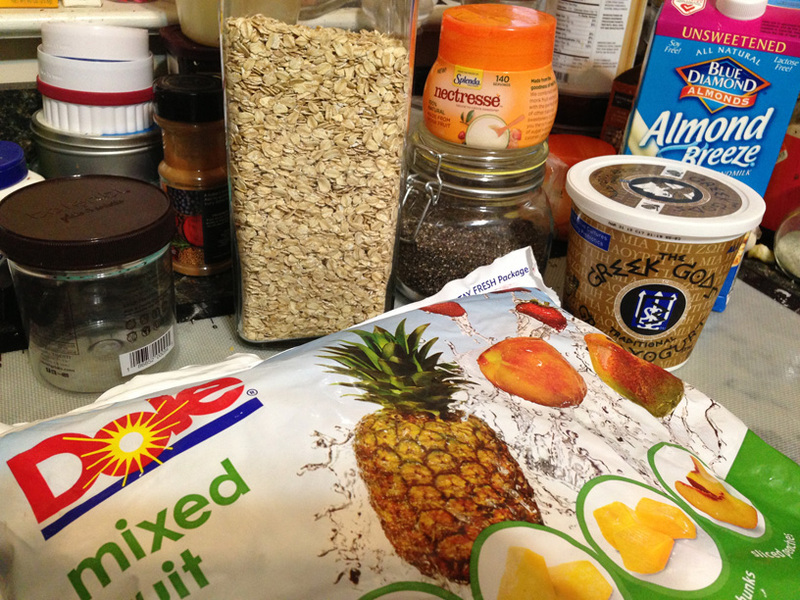 This method allows me to make him a nutritious, delicious, low fat, breakfast. Stay tuned for that post!! 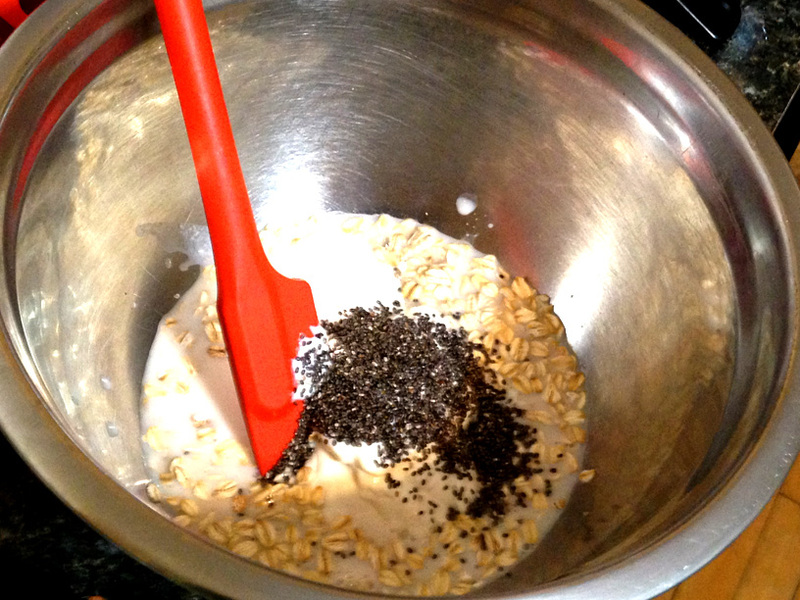 So, without further adieu…I give you my new, quick and easy “go-to” recipe for Breakfast! 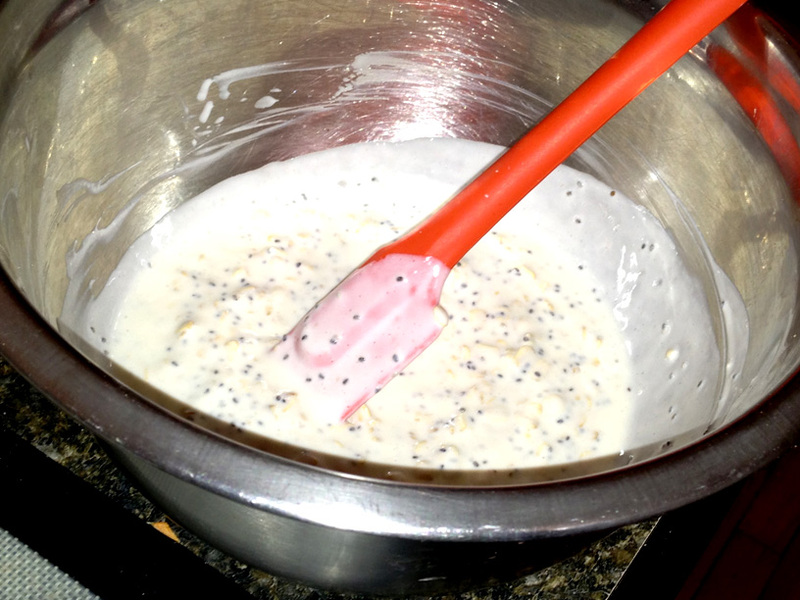 In a bowl, add milk, yogurt, chia seeds and oats. 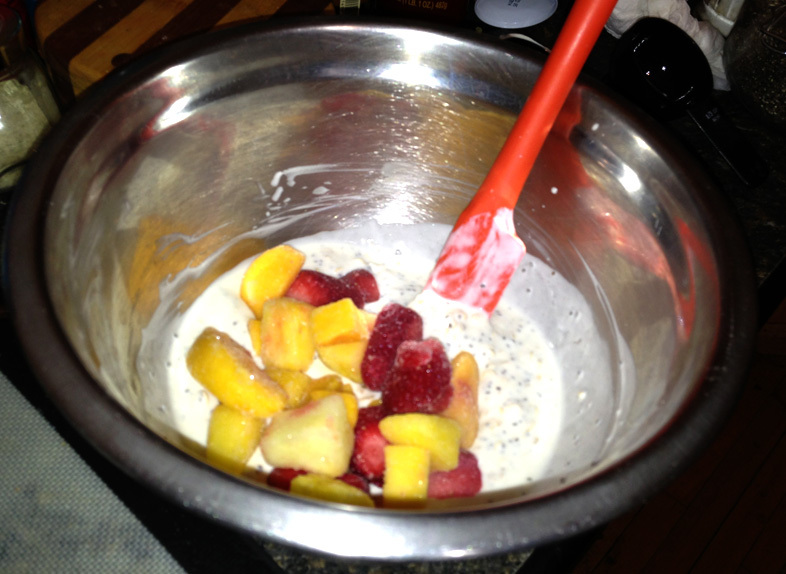 Add fruit, mix all ingredients so everything is coated. It may get stiff, due to the fruit being frozen, but don’t worry, it will thaw. Now comes the fun part…stuffing it into your jar. I will admit, when I first started doing this, I was using my mason jars. Thing is, they are heavy and glass. Carrying that to work is not so much fun. So, I have been using the jars from the gelatto that I get. They are plastic, washable, and easy to carry. When you add your mixture to your jar, give it a good stir, one last time to make sure everything is mixed well. Then refrigerate and enjoy the following morning. Enjoy! !